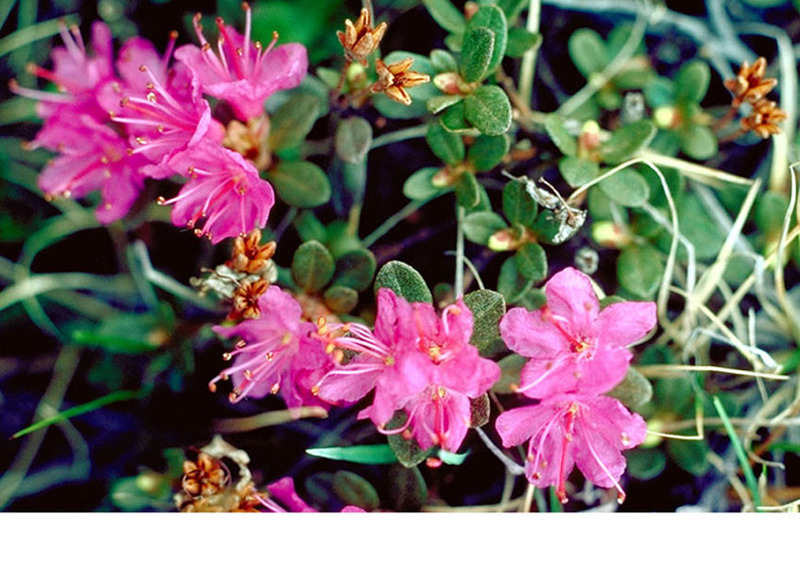 Flora of the Canadian Arctic Archipelago - Rhododendron lapponicum (L.) Wahlenb. Published in Fl. Lapp. 104. 1812. Type: Described from northern Scandinavia: "Alpibus Lapponiæ", selected by Jonsell, in Cafferty and Jarvis, Taxon 51: 753. 2002. Lectotype: LINN 215.6. right-hand specimen. Synonymy. Azalea lapponica L., Sp. Pl. 151. 1753. Rhododendron parvifolium Adams, Nouv. Mém. Soc. Imp. Naturalistes Moscou 3, 9: 237. 1834. Rhododendron lapponicum (L.) Wahlenb. var. 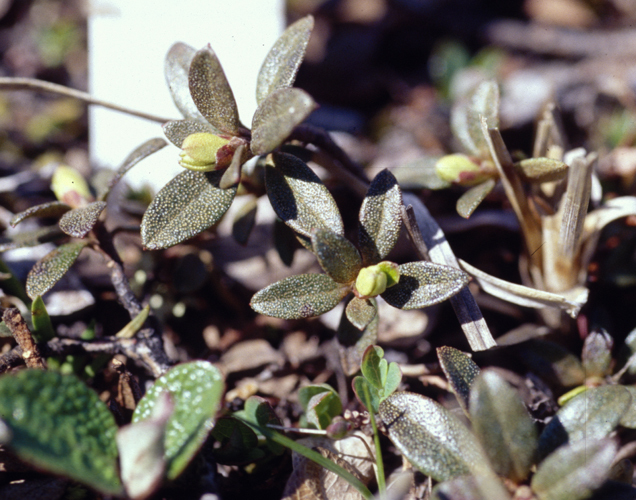 parvifolium (Adams) Herder, Trudy Imp. S.-Peterburgsk. Bot. Sada 1: 343. 1872. Rhododendron lapponicum (L.) Wahlenb. subsp. alpinum (Glehn) Khokhr., Sosud. Rast. Sovet. Dal'nego Vostoka 5: 133. 1991. Vegetative morphology. 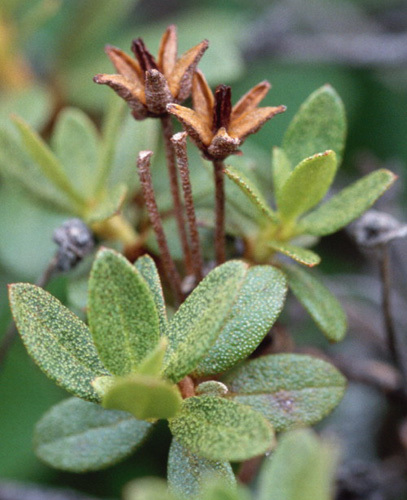 Plants 5–10 cm high (to 80 cm tall in protected sites where plants grow erect, near Churchill); shrubs; dwarf shrubs, or low shrubs. Aerial stems erect (in sheltered sites), or prostrate. Leaves present; distributed along the stems; alternate; persistent. Petioles present; 0.5–1.5 mm long; glabrous. Leaf blade bases cuneate. Blades 4–12 mm long, 3–6 mm wide, spreading, elliptic or oblanceolate, flat, appearing single-veined. Blade adaxial surface with sessile glands (that are very dense and appear as pock marks), glabrous. Blade abaxial surface without sessile glands or glandular hairs, glabrous. Blade margins entire, glabrous; apices acuminate, or acute. Reproductive morphology. Flowering stems two or more per plant. Inflorescences fasciculate (with a few flowers); lateral. Pedicels present. Bract leaves 5–10 mm long. Flowers per inflorescence (1–)3(–5); medium-sized. Sepals conventional; 5; free, or fused (at the base); 0.5–1 mm wide (tiny); brown. Calyx rotate; 5-lobed; with sessile glands; glabrous. Petals conventional; fused; 5; purple (fading pale purple or pinkish; very fragrant); 7–12 mm long. Corolla rotate; 5-lobed. Stamens 10. Anthers yellow. Anthers opening with a terminal pore. Anthers 0.8–1.4 mm long (opening by 1–2 terminal pores). Nectaries present. Ovary superior; carpels 5; syncarpous. Ovaries ovate; with sessile glands. Styles 1. Placentation axile. Ovules per ovary numerous. Fruit stalked; stalk 8–10 mm long; with calyx persisting; dry; a capsule; conical; yellowish; 4.5–5.5 mm long; 3.5–4.5 mm wide; glabrous (covered with sessile glands); surface appearing veinless; not distinctly flattened; dehiscent; opening with teeth at the top of the capsule; teeth 5. Seeds 1–1.2 mm long (ellipsoid); yellowish; surfaces smooth. Chromosome information. 2n = 26 and 52. 2n (4x) = 52. Janaki-Ammal et al. (1950). Ploidy levels recorded 2x and 4x. Ecology and habitat. Substrates: tundra, slopes, ridges, dry meadows; dry; rocks, gravel; with low organic content; non-littoral. North American distribution. Alaska, Yukon, Northwest Territories Islands, continental Northwest Territories, Nunavut Islands, continental Nunavut, northern Quebec, Labrador. Range in the Canadian Arctic Archipelago limited. Low Arctic, alpine. Arctic islands: Baffin, Devon, Banks, Victoria, Southampton (Boothia and Melville peninsulas). Northern hemisphere distribution. Amphi-Atlantic, or amphi-Beringian, or North American. Kharaulakh, West Chukotka, South Chukotka, East Chukotka, West Alaska, North Alaska  Yukon, Central Canada, Labrador  Hudson Bay, Ellesmere Land  Peary Land, West Greenland, East Greenland. General notes. Elven et al. (2003) indicated that a second taxon has been recognised as R. parviflorum Adams. 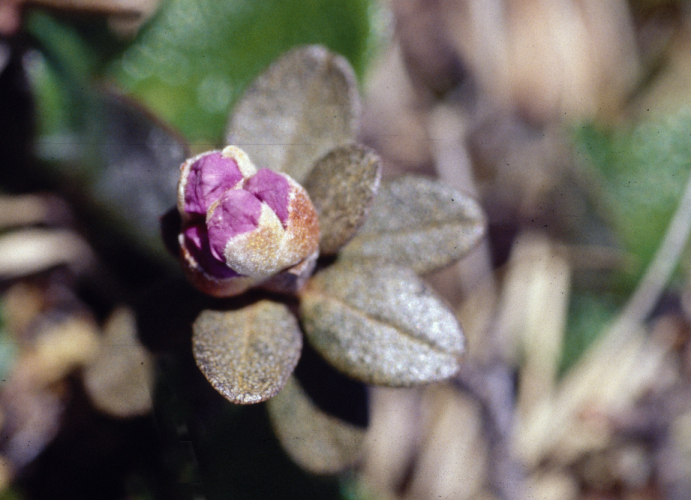 "The main difference between the taxa is the number of stamens: 5 in typical R. lapponicum, 10 in typical R. parvifolium, (5-)8(-10) in many East Siberian - Far East populations (Khokhryakov and Mazurenko 1991), and mostly 7–8 in the plants of Alaska and Yukon (Hultén 1968b). Vinogradova in Vinogradova and Yurtsev (1980) confirmed consistent occurrence of 10 stamens in the Asian populations. Statistical-geographic studies over the whole range of the R. lapponicum (L.) Wahlenb. aggregate are needed to determine the status of both taxa." At the present stage of knowledge of R. lapponicum s.l., the taxon R. parvifolium is included in R. lapponicum s.l., pending further study. Illustrations. • Habitat. 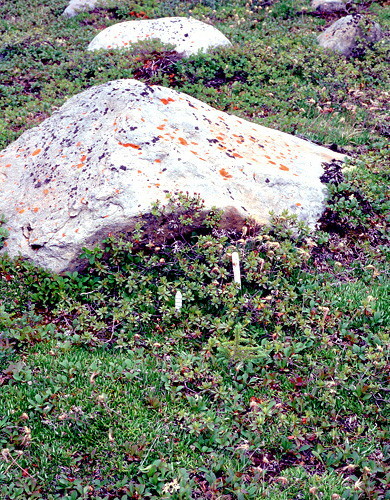 Shrubby plants, beside the markers, growing prostrate away from the rock and erect on the surface of the rock. Manitoba, Churchill. 22 July, 2001. Aiken and Brysting 01–006. CAN. • Terminal shoot bud in spring. Leaves turn brown over winter and the glands on the surface of the leaves become very conspicuous. As spring approaches the leaves turn green again and resume active growth. 2003. Photograph by Carolyn Mallory. • Flowering plant habit. 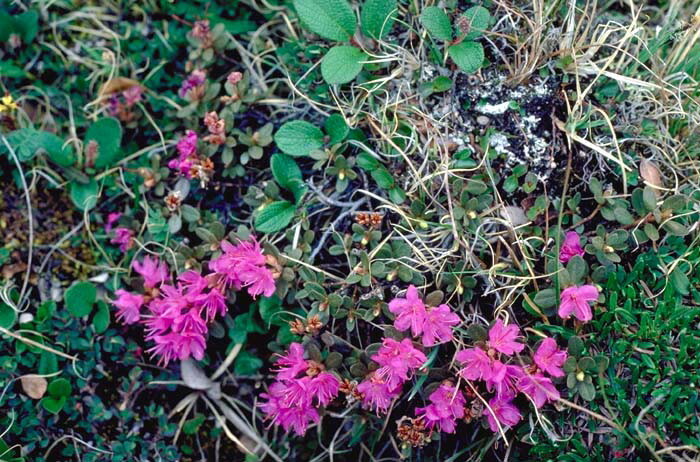 Conspicuous purplish pink flowers, (5-)10–15 mm in diameter, borne in groups of 2–4. Plants growing in a dense low Arctic tundra with Dryas, willow, Carex and Bilberry. Nunavut, Baffin Island, on rocky hillside north of Iqaluit. 19 July, 1982. J.M. Gillett 18959. CAN. • Close-up of flowers. Flowers 10–15 mm across, with bright pink petals, pale pink filaments topped by dark red anthers that shed yellow pollen from apical pores, and dark pink-red styles with small yellow capitate stigmas. Brown fruit capsules from the previous season have dehisced. Nunavut, Baffin Island, on rocky hillside north of Iqaluit. 19 July, 1982. J.M. Gillett 18959. CAN. • Close-up of stunted plant. 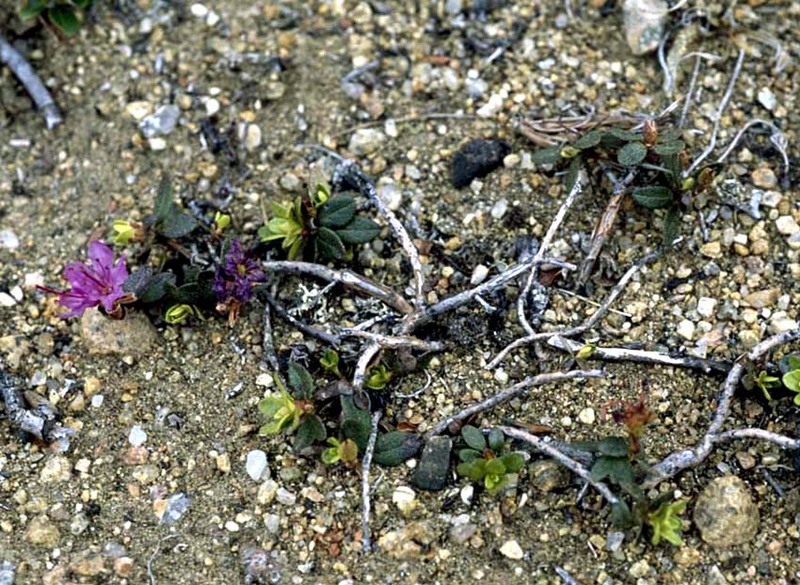 Close-up of stunted plant, growing in an unfavourable habitat. Nunavut, Baffin Island, Soper River Valley, near Mt. Joy. 7 July, 2002. Aiken. No voucher. • Inflorescence in bud. Inflorescence with three possibly four young buds with grey and rusty brown sepals and purple petals. Nunavut, Baffin Island, Iqaluit. Aiken 02–003. • Close-up of fruiting plant. 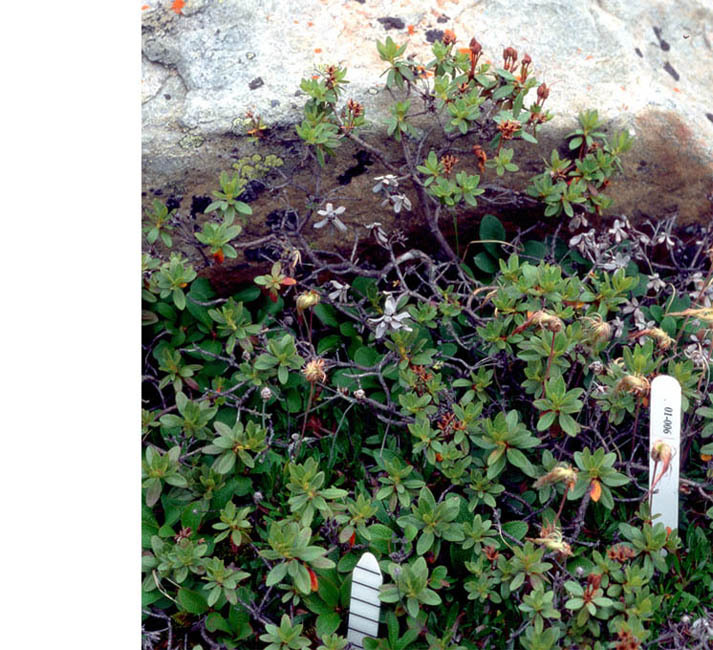 Shrubby plants, beside the markers, growing prostrate away from the rock and erect on the surface of the rock. Manitoba, Churchill. 22 July, 2001. Aiken and Brysting 01–006. CAN. • Close-up of leaves. Close-up of mature leaves that are covered with glandular dots. Note pale yellow green new leaves that are surrounded by stipules. Nunavut, Baffin Island, Iqaluit. Aiken 02–003. CAN. • Close-up of fruit. 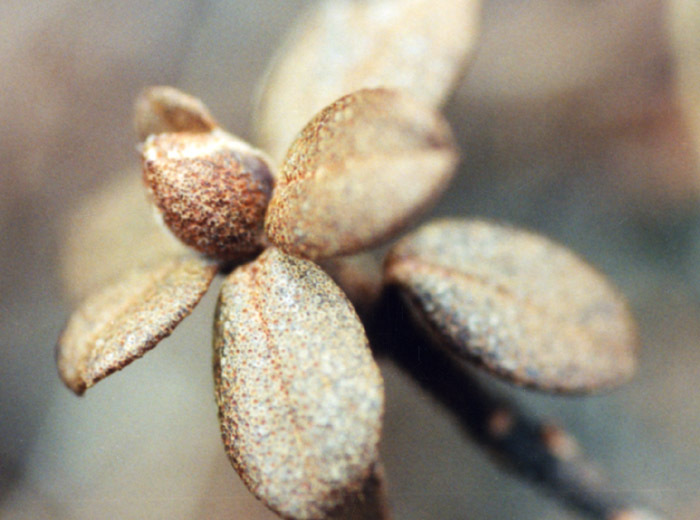 Capsules have split into the five segments of the original carpels (light brown) and show the central axis of the axile placentation (dark brown), characteristic of the family. The seeds have been dispersed. Aiken and Brysting 01–006. • Arctic Island Distribution.